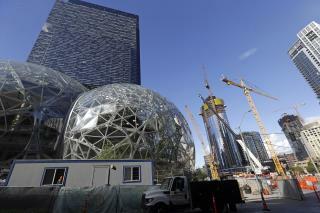 (Newser) – After more than a year of searching—and a fierce bidding war among cities across America and Canada—Amazon has decided to abandon plans to build a second headquarters that would be the "full equal" of its Seattle base, insiders say. Instead, sources tell the Wall Street Journal, the company has decided to split the new headquarters across two cities, with roughly 25,000 workers in each "co-headquarter." The sources say the company has decided to change its approach so it can attract more tech talent, and so it can lessen the impact a massive new base would have on housing and transit in its chosen cities. An announcement could come as soon as later this week, the insiders say. We got one of those warehouse hubs recently. Several times per day at work, we get people wearing the yellow Amazon vests delivering product. Basically they closed up the delivery system instead of using an outside company. These aren't headquarters, these are branch offices. Amazon is calling them headquarters because they can get better deals from local governments by doing so, and to try to convince people whose jobs are being moved that they aren't losing out. Bezos and the other top executives will continue to live and work in the Seattle "base", which will remain the real HQ. I hear the work environment there is incredibly toxic.